This article is about the building in Berlin, Germany. For other uses, see Reichstag (disambiguation). The dedication Dem deutschen Volke, meaning To the German people, can be seen on the frieze. Construction of the building began well after the unification of Germany in 1871. Previously, the parliament had assembled in several other buildings in Leipziger Straße in Berlin but these were generally considered too small, so in 1872 an architectural contest with 103 participating architects was carried out to erect a new building. After a short survey of possible sites, a parliamentary committee recommended the east side of the Königsplatz (today, Platz der Republik), which however was occupied by the palace of a Polish-Prussian aristocrat, Athanasius Raczyński. Work did not start until ten years later though, owing to various problems with purchasing the property and arguments between Wilhelm I, Otto von Bismarck, and the members of the Reichstag about how the construction should be performed. After lengthy negotiations, the Raczyński Palace was purchased and demolished, making way for the new building. In 1882, another architectural contest was held, with 200 architects participating. This time the winner, the Frankfurt architect Paul Wallot, would actually see his Neo-Baroque project executed. The direct model for Wallot's design was Philadelphia's Memorial Hall, the main building of the 1876 Centennial Exhibition. Some of the Reichstag's decorative sculptures, reliefs, and inscriptions were by sculptor Otto Lessing. On 29 June 1884, the foundation stone was finally laid by Wilhelm I, at the east side of the Königsplatz. Before construction was completed by Philipp Holzmann A.G. in 1894, Wilhelm I died (in 1888, the Year of Three Emperors). His eventual successor, Wilhelm II, took a more jaundiced view of parliamentary democracy than his grandfather. The original building was acclaimed for the construction of an original cupola of steel and glass, considered an engineering feat at the time. But its mixture of architectural styles drew widespread criticism. In 1916 the iconic words Dem Deutschen Volke ("[To] the German people") were placed above the main façade of the building, much to the displeasure of Wilhelm II, who had tried to block the adding of the inscription for its democratic significance. After World War I had ended and Wilhelm had abdicated, during the revolutionary days of 1918, Philipp Scheidemann proclaimed the institution of a republic from one of the balconies of the Reichstag building on 9 November. The building continued to be the seat of the parliament of the Weimar Republic (1919–1933), which was still called the Reichstag. The building caught fire on 27 February 1933, under circumstances still not entirely known. This gave a pretext for the Nazis to suspend most rights provided for by the 1919 Weimar Constitution in the Reichstag Fire Decree, allowing them to arrest Communists and increase police action throughout Germany. 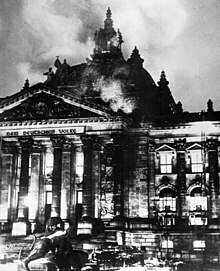 The burning of Reichstag had also created fear in the capitalists (US and west European states) of rise of communism in Germany. This furthered their policy of appeasement towards Hitler (who had portrayed himself as anti-Communist). During the 12 years of Nazi rule, the Reichstag building was not used for parliamentary sessions. Instead, the few times that the Reichstag convened at all, it did so in the Kroll Opera House, opposite the Reichstag building. This applied particularly to the session of 23 March 1933, in which the Reichstag surrendered its powers to Adolf Hitler in the Enabling Act, another step in the so-called Gleichschaltung ("coordination"). The main meeting hall of the building (which was unusable after the fire) was instead used for propaganda presentations and, during World War II, for military purposes. It was also considered for conversion to a flak tower but was found to be structurally unsuitable. The building, never fully repaired after the fire, was further damaged by air raids. During the Battle of Berlin in 1945, it became one of the central targets for the Red Army to capture, due to its perceived symbolic significance. Today, visitors to the building can still see Soviet graffiti on smoky walls inside as well as on part of the roof, which was preserved during the reconstructions after reunification. On 2 May 1945, Yevgeny Khaldei took the photo Raising a flag over the Reichstag, which symbolized the victory of the USSR over Germany. After the war, the building was essentially a ruin. 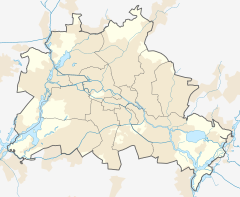 In addition, there was no real use for it, since the seat of government of West Germany had been established in Bonn in 1949. Still, in 1956, after some debate, the West German government decided that the Reichstag should not be torn down, but be restored instead. However, the cupola of the original building, which had also been heavily damaged in the war, was demolished. Another architectural contest was held, and the winner, Paul Baumgarten, reconstructed the building from 1961 to 1964. He removed all sumptuous heraldic statues, monuments, decorations, and the like that harked back to the mythology of the German past from the inside, and also the largest ones on the outside of the building. 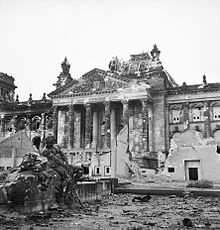 In effect, he created a plain building inside the historic Reichstag, retaining only the outer walls stripped of most of their statues and decoration. The artistic and practical value of his work was the subject of much debate after German reunification. Under the 1971 Four Power Agreement on Berlin, Berlin was formally outside the bounds of either East or West Germany, and so the West German parliament, the Bundestag, was not allowed to assemble formally in West Berlin. This prohibition was obeyed even though East Germany had declared East Berlin its capital, violating this provision. Until 1990, the building was thus used only for occasional representative meetings, and one-off events. It was also used for a widely lauded permanent exhibition about German history called Fragen an die deutsche Geschichte ("Questions to the German history"). The official German reunification ceremony on 3 October 1990, was held at the Reichstag building, including Chancellor Helmut Kohl, President Richard von Weizsäcker, former Chancellor Willy Brandt and many others. The event included huge firework displays. One day later, the parliament of the united Germany would assemble in an act of symbolism in the Reichstag building. However, at that time, the role of Berlin had not yet been decided upon. Only after a fierce debate, considered by many as one of the most memorable sessions of parliament, did the Bundestag conclude, on 20 June 1991, with quite a slim majority in favour of both government and parliament returning to Berlin from Bonn. In 1992, Norman Foster won yet another architectural contest for the reconstruction of the building. His winning concept looked very different from what was later executed. Notably, the original design did not include a cupola. Before reconstruction began, the Reichstag was wrapped by the Bulgarian-American artist Christo and his wife Jeanne-Claude in 1995, attracting millions of visitors. The project was financed by the artists through the sale of preparatory drawings and collages, as well as early works of the 1950s and 1960s. During the reconstruction, the building was first almost completely gutted, taking out everything except the outer walls, including all changes made by Baumgarten in the 1960s. Respect for the historic aspects of the building was one of the conditions stipulated to the architects, so traces of historical events were to be retained in a visible state. Among them were graffiti left by Soviet soldiers after the final battle for Berlin in April–May 1945. Written in Cyrillic script, they include such slogans as "Hitler kaputt" and names of individual soldiers. However, graffiti with racist or sexist themes were removed, in agreement with Russian diplomats at the time. The reconstruction was completed in 1999, with the Bundestag convening there officially for the first time on 19 April of that year. The Reichstag is now the second most visited attraction in Germany, not least because of the huge glass dome that was erected on the roof as a gesture to the original 1894 cupola, giving an impressive view over the city, especially at night. The large glass dome at the very top of the Reichstag has a 360-degree view of the surrounding Berlin cityscape. The main hall (debating chamber) of the parliament below can also be seen from inside the dome, and natural light from above radiates down to the parliament floor. A large sun shield tracks the movement of the sun electronically and blocks direct sunlight which would not only cause large solar gain, but dazzle those below. Construction work was finished in 1999 and the seat of parliament was transferred to the Bundestag in April of that year. The dome is open to visitors by prior registration. This page is based on the Wikipedia article Reichstag building; it is used under the Creative Commons Attribution-ShareAlike 3.0 Unported License (CC-BY-SA). You may redistribute it, verbatim or modified, providing that you comply with the terms of the CC-BY-SA.